Entry : Rs. 100 for adults and Free for kids. 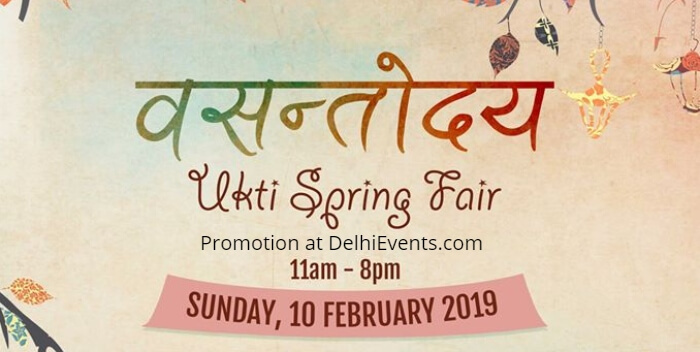 Event Description : FEST "Vasantodaya - Ukti Spring Fair"
The Spring Fair is our invitation to Delhi-NCR to come out of city life for a day. To come together with family and friends to celebrate the onset of a new season, spring, to welcome new hopes and the old ways of being and bonding. To slow down, listen, connect, and rejuvenate. To talk, sing, relax, even snooze under the warm sun. To connect with nature and with our own inner child. It’s time for wholesome food, crafts, creativity, music. For sounds of laughter and bonhomie, for friends and kindred, compassionate communities. In its fifth year now, the uniqueness of the Ukti Fair is that it has been conceptualized, planned and organized by a community of parents who chose Waldorf education for their children and together formed Ukti, the Delhi Waldorf School. The one-day Fair is primarily a representation of the thoughts and the philosophy that have gone into the conceptualization of an alternative system of education. The propagation at the Fair of natural, handwork creations, earth-embracing products and unhindered play, encouraging imagination and the idea of exploring not just oneself but also the world around, is done via workshops, games and activities as well as the products available at the stalls. Each activity at the Fair is done in a sustainable and ecofriendly manner. For instance, the power for the Fair is being generated via solar energy, while the venue is a farm with its own water-harvesting system. The products sold at the event are handmade, mostly composed of natural or recycled materials. And yes, there will be storytime with puppetry, finger-knitting and crochet, lantern making, mandalas, old-timey games, drum circle and sitar recital, and more!